Typical “Bio” or “About” pages merely list off major accomplishments and dry, boring information. They don’t really tell you much about the person. Don’t get me wrong, I think background information is still important – and I’ll fill in the gaps of mine below – but I think getting to know the person is even more important. To that end… here it goes! I always wanted to have my own business, but I did not know what exactly I wanted to do. I was nudged by my older brother to learn a technical skill – hence my accounting degree from St. Bonaventure University (which ultimately lead me to get my CPA license). While attending St. Bonaventure I was again nudged by my business law professor who suggested that I should go to law school. After 4 years of college, I had no interest in continuing with formal schooling so I got a job instead. A few years later, however, and I decided I was ready to tackle law school. I attended University of Buffalo Law School and after graduation, I started working with a law firm in Elmira, New York. My duties included preparing estate plans and working with small businesses. I was lucky enough to really enjoy these areas and my CPA background really helped in these areas as well. However, my desire to have my own business did not go away. After several years I parted ways with my old firm and struck out on my own. A recent turn of events in my own family cemented to me what I should be doing (luckily I was on the right track). This experience convinced me that I was supposed to help people plan their estate and make things as easy as possible for them and their loved ones. Working with families the way that I do, I witnessed what I thought were terrible things. Parents and children not speaking with each other, siblings that once got along great were now bitter towards each other. I’ve personally seen too many people get hurt or fight over estates. This often occurred in families where people did not think it would happen to them because their families were so close. Sadly, they were wrong. And I realized that there weren’t enough professionals providing good plans and trying to prevent these unfortunate incidents. These experiences inspired me and set me on my current mission. No longer do I sit back and hope these things don’t happen to my clients. Instead, my work is focused on designing estate and business succession plans for people who want to be proactive and do everything possible to make things easier for their loved ones. This includes both while they are alive in case of a disability, and after they have passed away. Dealing with disability is a central part of my plans, unlike typical estate plans that only focus on where property should go after someone passes away. Instead I work on plans that are carefully designed to work in case of a disability, in addition to addressing how to pass on family wealth, the family businesses and family values. Many of my plans even include provisions to provide asset protection for loved ones – protection from divorcing spouses, creditors, predators and lawsuits – that they are not able to provide for themselves. All this while minimizing taxes and fees. Besides the law, I am first and foremost a husband and a father. My family is my life’s focus. I have an eleven-year-old son and twin girls who just turned nine – if I look tired, now you know why. Because of my work, I have seen what can go wrong with an estate plan – and why. Fortunately this experience allows me to make sure my children won’t have to face that. This is also why I create unique and personal plans for each of my clients. It may take longer and cost more, but ultimately it provides much better protection than the one size fits all plans that other attorneys prepare. As an individual I have a passion for learning. One great thing about being an attorney is the continuing education opportunities that are available to me. I commit a substantial amount of time and energy to professional development such as attending estate planning and asset protection conferences to learn new techniques or ways to improve on traditional, old-school planning. Not only is it fulfilling to me, but it also allows me to create better plans for my clients as well as for my own family. Oh, and I’m a huge Pittsburgh Steelers fan (as those of you who’ve been to my office well know!) Don’t worry if you’re not, I won’t hold it against you…much. 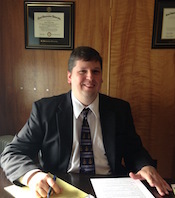 I graduated from the University of Buffalo law school in 1999 and was admitted to the New York State Bar. While attending law school, I earned a certificate in Taxation Law and won the school’s Moot Court Competition. I find it amusing that although I won the highest law school award for advocacy, which gave me a membership to the Order of Barristers, I now spend most of my time helping people avoid court completely. I now live in Painted Post, New York and am involved with several local charitable organizations including the Corning Chamber of Commerce and the Corning Painted Post School District Foundation. I also speak at several presentations on various estate and business planning topics every year.